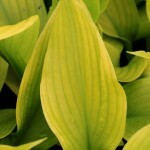 A larger Hosta with immense leathery leaves that emerge chartreuse. Color turns to gold with age and morning sun. The light lilac flower are held on 3' tall spikes in mid summer. Prefers part to full shade and moist soil. Plant in large groups or as a specimen.